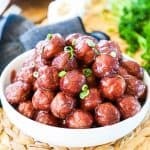 These Grape Jelly Meatballs are a classic party appetizer! Whether you are making them for a potluck, barbecue, or office party, they are quick and easy to whip up and always a hit with the crowd. The crock pot makes them extra simple to cook and will keep them warm through the length of the party. Mix the grape jelly, chili sauce, and sriracha (if you want it a little spicy) together with a whisk inside the slow cooker. Add 3-5 lbs of frozen meatballs and stir into the sauce until they are all coated. Cover and cook on high for 2 hours or low for 4 hours. Leave on "keep warm" setting while serving. Nutrition facts provided based on using 5 lbs of meatballs. I use my best estimation for the recipe and may not be accurate depending on what brands you use or modifications you make to the recipe. I recommend using a nutrition calculator with the exact brands and measurements you use for the most accurate calculation.